Too many eosinophils in the airway worsen asthma (A). The study found that unique sugars on mucus protein Muc5b activate sugar-binding protein Siglec-F to prompt eosinophil death (B). Medical illustration by Jacqueline Schaffer. Eosinophils are a type of white blood cell meant to attack parasites, but when too many of them get activated in tissues they can worsen asthma, allergies, eczema and other chronic diseases. Northwestern Medicine scientists have revealed that sugars on a specific mucus protein can induce eosinophil death and help combat asthma. Dr. Bochner and others previously discovered a sugar-binding protein on the surface of human eosinophils called Siglec-8. When activated, the protein signals eosinophils to undergo programmed cell death, or apoptosis. In the new study, published in the Journal of Allergy and Clinical Immunology, he and collaborators searched for sugars that occur naturally in the body that can trigger Siglec-8. 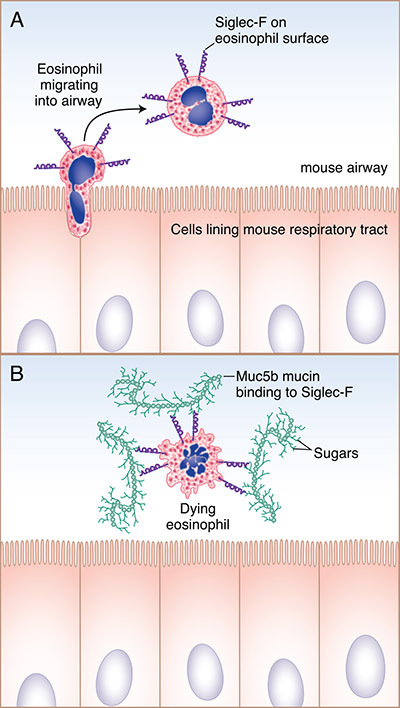 Investigating Siglec-F, the version of Siglec-8 expressed in mice, the scientists found in vitro and in vivo that unique sugars on the mucus protein Muc5b activate Siglec-F to prompt eosinophil death. “We showed that mice missing Muc5b develop worse eosinophilic inflammation in their airways. If you incubate this specific mucin with eosinophils, not only does it bind to Siglec-F, but when it does, it kills the eosinophils,” Dr. Bochner said. The findings suggest that airway mucins are an important pathway for reducing high levels of unwanted eosinophils. Further research on the specific sugars at play could lead to novel treatments for asthma. “Maybe we can enhance the body’s own ability to get rid of these wayward eosinophils that shouldn’t be in the airway,” Dr. Bochner said. Ongoing work is testing the findings in human cells. The study was conducted in collaboration with the University of Georgia and the University of Colorado. It was supported by National Institutes of Health (NIH) grants AI72265, HL080396, ES023384, HL109517, P41 GM103490 and HL107151 and American Heart Association grant 14GRNT19990040.